Gartner has predicted a backlash against voice assistants like Siri – but recommends that businesses deploy them anyway. 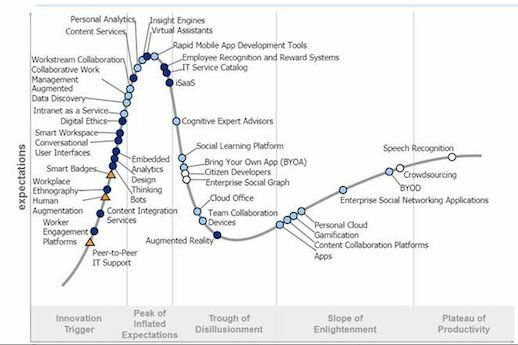 This we learn from its "Hype Cycle for the Digital Workplace 2017" report, which positions virtual assistants right at the top of the "Peak of Inflated Expectations", and about to embark on a dizzying ride down into the "Trough of Disillusionment". "Businesses that have not begun the process of deploying VAs to interact with customers and employees should start now," explains Gartner VP Matt Cain, presumably because bot-batty businesses feel they are not receiving enough public ridicule already. "VAs' importance will grow as society moves into the post-app era in the next five years," Mr Cain predicts. Mr Cain is the "Winner of the Gartner Thought Leadership Award for his work on the digital workplace". Perhaps Gartner needs to follow reality more closely than its clients' chequebooks. The "chatbot" part of the AI assistant proposition is very costly for businesses that deploy them as you can read here and here. 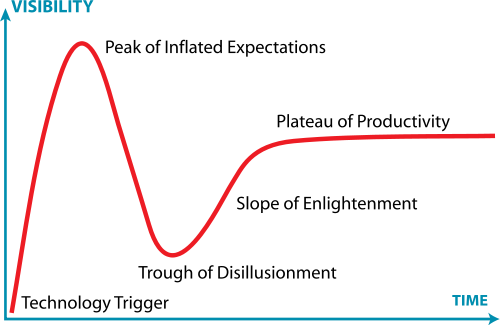 The Hype Cycle also predicts bad news for "citizen developers" and "cognitive expert advisors" – whoever, or whatever, they may be. 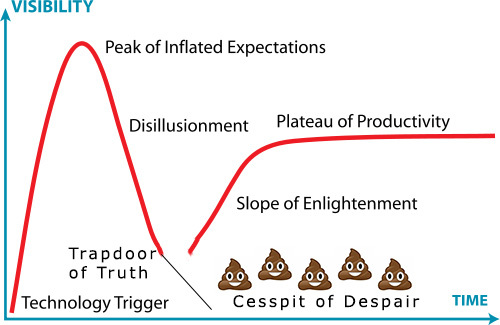 We've always felt there's something rather obvious missing from Gartner's Hype Cycle. Not all technology reaches a "slough of despond" but much, if not most, simply passes through the Trapdoor of Reality into the Cesspit of Despair, from which it never escapes. We're all holding our breath about Smart Dust. Aren't you?